The Best Western Orlando West offers 107 well-appointed rooms featuring free high-speed Internet and free long distance access. Other hotel amenities include a swimming pool, restaurant, lounge, and meeting room accommodating up to 45 people. Visitors staying with us experience a garden style hotel with knowledgeable service oriented staff. 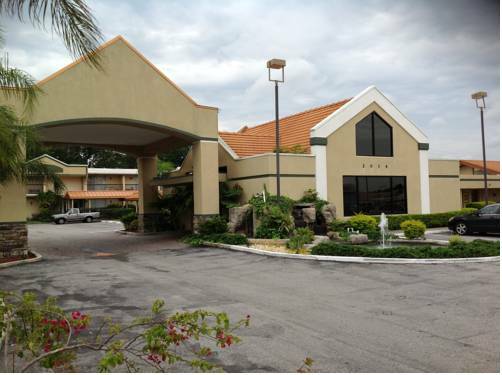 The hotel is ideally situated in the city of Orlando. Guests staying at this hotel will enjoy the surrounding lush foliage, ornamental garden style landscaping with premier shopping and dining facilities in close proximity. You will be glad you are staying at the Best Western Orlando West for its convenient central location. Easy access to exciting area attractions such as Walt Disney World , Universal Studios /Islands of Adventure with The Wizardly World of Harry Potter, Gator Land, SeaWorld , Wet N' Wild, Holy Land Experience, and many more will make your stay enjoyable. Orlando is known as the City Beautiful and we hope you take some time during your stay to visit the many points of interest such as the Orlando Science Center, or the Art Museum at Loch Haven Park just ten minutes away. Enjoy a stroll down quaint Winter Park streets with its boutiques and shops, or stroll around Lake Eola with its beautiful fountain in downtown Orlando. Shop the many malls, such as Fashion Square, West Oaks, Florida or the Millennia Mall. Transportation is available with many cab services, AMTRAK, Orlando International Airport, Greyhound, and the local Lynx system. Enjoy your stay. From: Interstate 4 East. Take Exit 83B. The Best Western Orlando West is just ahead. From: Interstate 4 West. Take Exit 84. The Best Western Orlando West is just ahead. From: Florida Turnpike. Take Exit 265 to 408 Exit 8A (John Young Parkway), turn left to Route 50, turn right 1.50 blocks on your right. The Best Western Orlando West is just ahead. Celebrity Delly, on premises, open 7:00 a.m. to 2:00 p.m. Mon.-Fri., 7:00 a.m. to 12:00 p.m. Sat.-Sun.